Oh god help us all…it’s another Lucas post. I have to say I it’s easy to write about Lucas. He gives me plenty of material, that one. I’ve been meaning to write this for a while, but today’s shenanigans solidified the need to tell these stories. Me: Lucas, you need to remember to go to your teachers and get your work before we leave. Lucas: Why? Where are we going? Me: (a few beats later) Umm, we’re going to Canada. Remember? Me: So remember to talk to your teachers tomorrow. OK? Lucas: I’ll try to remember, but I’m not sure I will. Me: Well, write yourself a note so you remember, please! This is important. This could affect your grades. Lucas: I’ll write it now. And I wipe my brow with the back of my hand as I exclaim “PHEW” behind Lucas’ back. 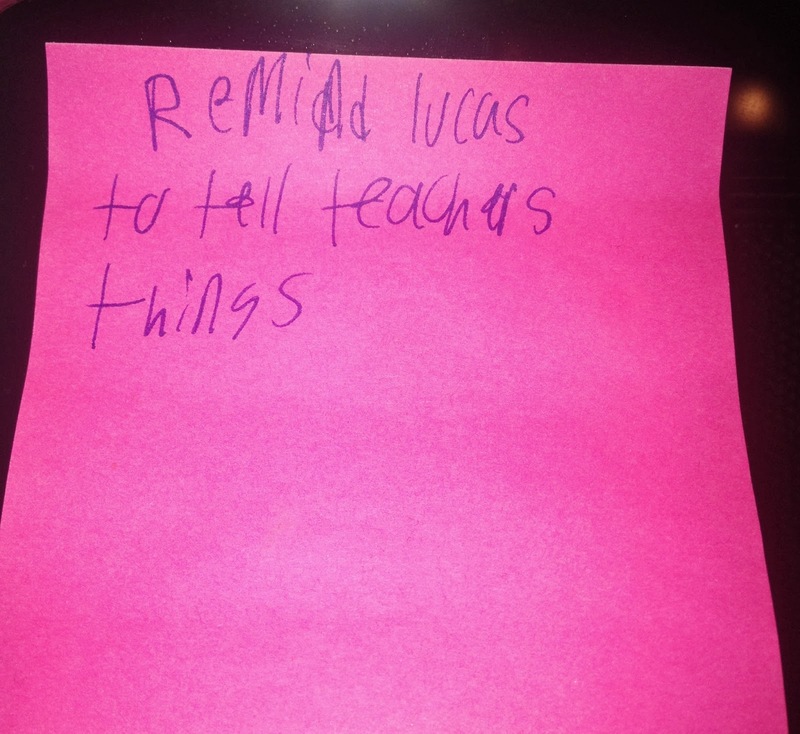 A little while later I walk into the kitchen to close it down for the night and I see Lucas’ note ~ to himself. Well, that about sums it up. It’s brief, to the point and not signed “From Lucas” as many of his other notes to himself have been. On the bright side, he did remember to talk to his teachers and get his work so he was prepared for our trip. Gotta look at the bright side. My mom was having cataract surgery last week and I needed to drive her there and home. It was going to be early and dark. I didn’t need my dad trying to drive my mom, it would be like the blind driving the blind ~ no lie or exaggeration. I didn’t think I could have lived with if something happened and it’s a huge part of the reason they’re here ~ so we can help when they need us! So I was her scheduled chauffeur for that morning. I just needed to brief the kids. I would be leaving far before anyone was up. They were going to be on their own for breakfast. Lunches would be ready and waiting on the counters, except for sandwiches in the fridge. Claire – CHECK! She’s got this handled! Zach – CHECK! NO worries with him! 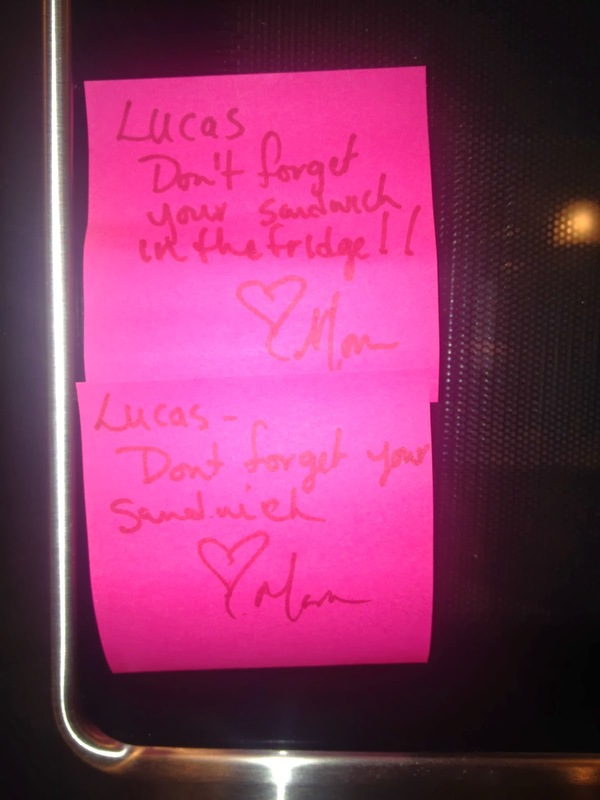 Me: Lucas, don’t forget your sandwich tomorrow. I’ll leave the rest of your lunch on the counter, but you’re going to have to remember to get your sandwich out of the fridge. Lucas: OK, but can you write me a note? He remembered his lunch. Thankfully! Lucas: You should most definitely pick me up. Me: No. It’s not. All classes have use. Lucas: Not playing games all class. Lucas: We are just listening music and playing games. Lucas: AND we have to go to school on President’s day. With all of their snow days they’ve had, we just found out this afternoon that President’s day is no longer a holiday. It will now be a school day like any other. Me: I know! That totally blows! But I thought it would happen. Lucas: So pick me up? Me: Can’t you see the sign on my door? Lucas: I know I’m hilarious. Now I should get to come home. Me: READ THE SIGN! I’m writing and I may bite you! Lucas: Ok ok. So I don’t have to go to hockey, right? Lucas’ team has been a train wreck for most of the season. They did one thing right and they won a tournament taking us to Canada. Other than that they have had zero, zip, none, nada, zilch and I mean NO success! Lucas and the rest of the team are ready for this season to be over. Me: It’s your last practice before your last league game. Me: You’re killing me, dude! Me: You’re giving me plenty of blog material today. Me: Writing it now as a matter of fact. He just came in from school, laughing. He walked to my door, put his face in a pain of glass and gave me his great Lucas grin. I called him into my office. He came over to me, chuckling the whole time. 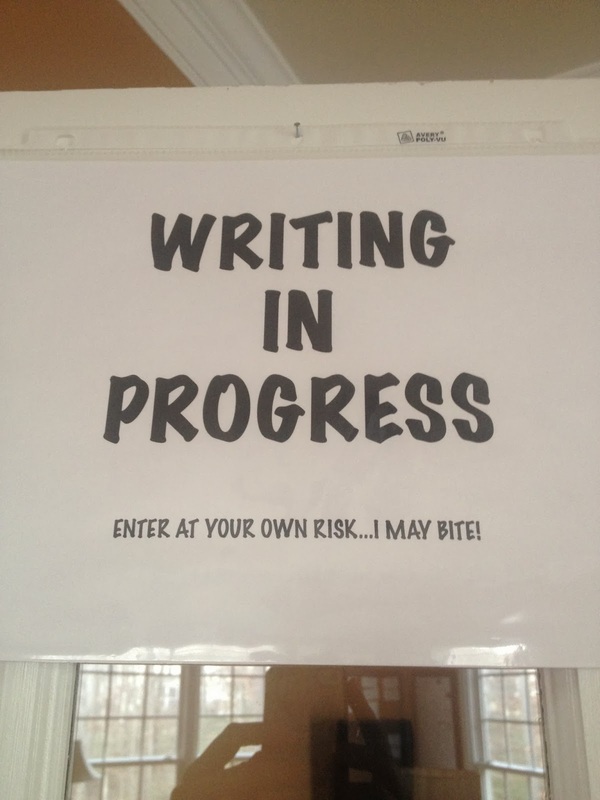 And so I did what my sign on my door says I might do. I bit him. Ever so slightly and lightly and through layers of clothes, but I did get my teeth on his sweatshirt. He can’t wait to read this blog, so I guess I better get it edited and posted. Oh, for the love of Lucas….